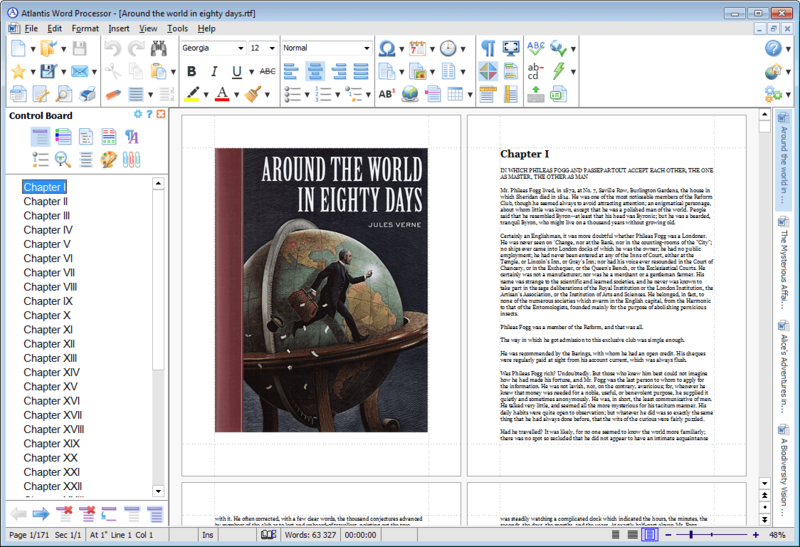 Atlantis is a full-featured Word Processor with an innovative approach to document processing. It has been carefully designed with the end-user in mind. When processing text is work enough, the last thing you need is a bloated software with a slow and awkward interface. It is an intuitive user-friendly application and provides all the tools both novice and power users need for their everyday word processing tasks. Frequently updated, many interesting features. Fast, really fast. And very compact. TABLES!! and they work.. great WP there are great free ones but this is to me, just better layed out and works the way i expect a WP to .. its not MS OFFICE but for what I need its great and supported. Cute tool to quickly create ePub. Reviewing Version 1.6.5.5 - This is still one of the best word processors available. Tables would be nice and are apparently on the way. Over a year since my last review. This is still a very good piece of software. It would be nice to have tables and to be able to wrap text around an image. Both are supposed to be coming but should be there now. Compared to "Office Suites" this is lean and mean and just does the job. Great! Very light, and just the features you need for an every day word processor. Has 95% of the features of WinWord with 5% of the bulk. I especially like the way it uses WordWeb thesaurus, and has an inline spell checker. Try it, you won't be disappointed! Great program. Love the recently added ability to create epub files for ebook readers. Much easier to use Atlantis for this than, say, Sigil or BookDesigner if you have a lot of formatting changes to make, what with Atlantis's excellent Styles implementation. This assumes you can get your source into Atlantis, which you usually can if you get creative. Output files work great on Sony and Hanlin ereaders (the only devices I have available). A friend of mine says they also look good on his iPod Touch using the Stanza reader program. It's good to see a word processor actually developing new features to keep up with modern trends such as the rising popularity of ebooks, rather than just relying on poorly-written third-party plugins to do the job for them. Seems like a lot of word processors these days seems to be primarily interested in reshuffling their user interface. Having looked at the mess of a UI (from the screenshot) I wasn't overly hopeful - seriously how to make a program look confusing - stick 1000 icons all over it. I installed it nonetheless.. erm, it was... well it was ok. Not terrible, but not that good either. OK I didnt' test it thoroughly, but to be honest that was because it's so damn fugly - it's really horrible to use. I found use it, even in basic form, just.. lacking.. somehow. If it was free, I'd say, ok, maybe it'd be worth hanging on to. But There are some pretty good freeware word processors already: Abiword, Openoffice (if you can stand the huge download) Heck, even wordpad is ok when there's nothing else. Openoffice, is significantly better than this, Abiword is too, and Abiword is also a lot lot easier to use also. Openoffice & Abiword are portable, so I really can't find a reason why I'd ever use this. It's not good, it's not free and there are cheaper and better alternatives out there. Pros: very lightweight, you can even carry it on a pen drive. Cons: I only went as far as finding one, but a big one: it is very incompatible with Word files. Compatibility is so bad that I found Wordpad to do a better job. So if I wanted something lightweight, I'd just use Wordpad, which is more compatible and you don't even have to worry abut carrying it around. For the fun of it, I tried to open a 200 pages thesis, and it hanged. I thought it would just render the formatting poorly, but nope, instead it crashed. In other words, I had low expectations, and it failed to meet them. So overall, not worth the money. Either use Wordpad if you want to save cash and not have to install a large package. And if you want the full blown compatibility with support for all bells and whistles, it looks like you'll still have to stick with MS Office. I'll still keep an eye on it, but it looks like it will take some time before it can be properly usable. And when they do, I bet that they'll crank up the already high price tag, so I'm not holding my breath. Pros: eBook conversion is great. The multitab interface. Very customizable. Cons: There are only two language versions of the program - English and French. No way to translate the menus. Bottom Line: Frequently updated, many interesting features. Fast, really fast. And very compact. I've owned a copy of Atlantis for three or four years now. Why use bloat-ware like M$ Office or OOo if you only need word processing? If you need a spreadsheet as well the have a look at GS-Calc from Citadel-5 Software (http://www.citadel5.com/). At this time in the game, at best it should be shareware/donation ware. With Zoho, Google Docs, Jarte etc. who wants to pay that much for a fourth of an office suite? If this was free, I probably wouldn't use it because there are so many other free word processors out there that are more mature and well supported. However, charging $35 for this? LMAO, seriously that is hilarious. Why we need this? What's the point? The opensource community have a lot of good projects. Abiword, go-office (Novell's openoffice), Lotus (IBM's openoffice), OpenOffice and many another unique builds. I give you one star. My MS office 2007 works perfect (with crossover) on my openSUSE Linux Box. got money to burn? buy MS Office. but why in the hell would I pay 35 bucks for this? to avoid bloat? lol.